KUALA LUMPUR: Setiatiwi Group, is launching the final phase of its 16 acre (6.5ha) Taman Adenium project located in Bukit Beruntung, Selangor tomorrow. The group is an associate company of Sunshine City Development Sdn Bhd. The final phase launch will feature 58 units of 20ft by 60ft 2-storey link houses covering over four acres of land. The two previous phases which featured 137 units of 2-storey link houses have been fully developed and sold according to Setiatiwi chief executive officer Dr Lee Yuen Pen. “Our phase 1 and 2 launches received an overwhelming response from the public, with take-up rates of 100% on the first day of the launch. This is due to our attractive prices and strategic location, which is less than 1km from the toll on the North-South highway (Expressway),” commented Lee in a written response to The Edge Financial Daily. Lee said that the target group for the houses would be first-time homebuyers currently residing in Rawang, Kepong and Petaling Jaya. 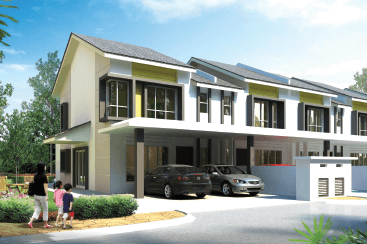 “The average cost of the intermediate units is RM296,391 for bumiputera and RM318,700 for non-bumiputera. This makes it affordable for the middle-class income group.The average built-up is 1,600 sq ft,” Lee said. Lee said that the Taman Adenium units were priced competitively lower compared with developments in surrounding areas such as M-Residence Rawang by Mah Sing Group Bhd and Emerald Garden by GuocoLand (M) Bhd, which are selling at around RM290 psf. He added that the group has decided to launch the remaining units of the development now so as to keep the price of property affordable in view of the implementation of the goods and services tax next year where a slight increase in development cost is expected. The company has completed several developments in Bukit Beruntung such as Taman Tanjung and Taman Adenium Business Park. An earlier story on Bukit Beruntung by City & Country in The Edge weekly (Dec 1 to Dec 7) reported that property values in the area have been steadily rising as general sentiment towards the area continues to improve. The expansion of a Perusahaan Otomobil Kedua Sdn Bhd, or Perodua, plant and Tesco Stores (M) Sdn Bhd distribution centre in the area have helped improve its economic activities.